Partnering with beauty brand La Mer, Project 0, an oceanic conservation organization, brought together some of the world’s most influential artists, designers and culture-makers to create their own wave-inspired, charitable works of art. 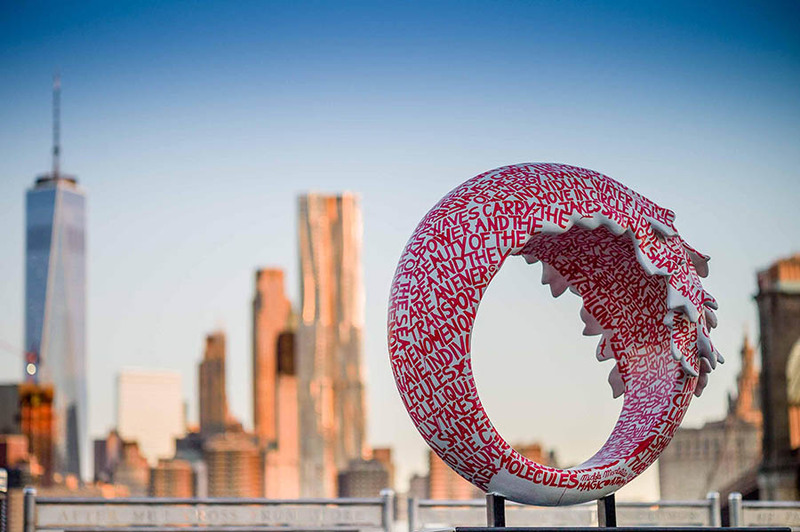 The 54 wave sculptures will be on display throughout the five boroughs of NYC from mid-May through June 21st to commemorate United Nations World Oceans Day on June 18th. Some of the artists featured include Julian Schnabel, photographer Bruce Weber, fashion designer Vivienne Westwood, Brooklyn-based artist Dustin Yellin, the musicians Slash, Rufus Wainwright, entrepreneur Richard Branson, Queen Noor of Jordan, model Cara Delevingne, and actress Sienna Miller. The waves are “inspired and influenced by the ocean,” and “transmit the artists’ personal joy, hope, and inspiration for the ocean.” All the works can be purchased and will benefit the La Mer Blue Heart Oceans Fund for Project 0, which is focused on Marine Protected Areas. MARTOS’ role included preparing the required wind calculations for each of the 54 sculpture locations. Our analysis took into account coastal wind regions and reductions in load for temporary installations. For the Oculus station location, we verified the total weight of the structure including the ballast to ensure floor slabs were not over stressed.